The CoffeeShop Blog: CoffeeShop Photography Tutorial: American Beauty Berry: Same Berries, Different Angles! 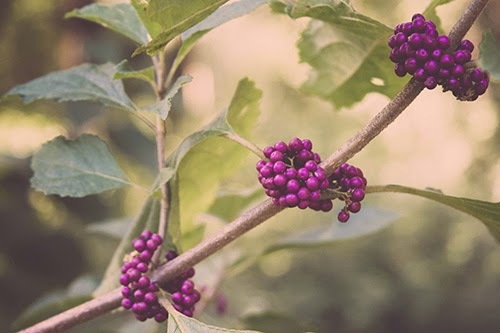 CoffeeShop Photography Tutorial: American Beauty Berry: Same Berries, Different Angles! This year I dropped out of our homeschooling co-op to take a break. I enjoyed being a part of a group once a week, but I decided that this year we would spend more time in nature. My boys love being outdoors, and now that they are older I see that they are wrestling/attacking each other a little less and paying more attention to the nature around them. Yesterday we went on a 4 mile hike in a local wooded park and saw a wild rabbit, a dying young raccoon (sad), a beautiful spiky green caterpillar that stung both Duke and me when we picked it up, a dead copperhead snake (also sad, apparently an earlier hiker had stepped on it, probably on purpose), and leaf-cutting ants. The ants really impressed the boys, they spent almost an hour crouched by their trails and anthills watching them cut the leaves and transport them back to their home. The boys would rub out part of the trail to remove the ants' scent trail and crack up when the little ants started freaking out and running off to the sides in panic. I have enjoyed being a "lone wolf" homeschooler this year because it allows us the freedom and time to stop and study ants for an hour. As an adult I have a tendency to be in a rush, "Ok, those are ants, time to move on! ", but I have learned that children need the freedom to stop and study what grabs their interest. This is one reason I am skipping the homeschooling field trips this year. When you go on field trips with large homeschooling groups, the adventures are usually adult-run, stressful, and rushed. One perk of allowing the boys the extra hour to study an ant or a caterpillar is I can shoot photos uninterrupted. 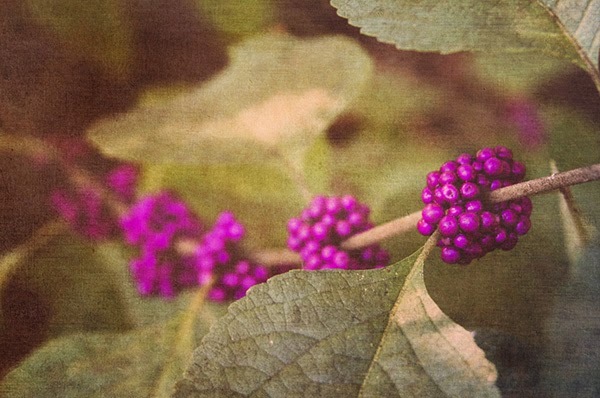 I love the American Beauty Berry, and I was excited to find this bush filled with berries. As I was staring at my tiny screen image of it, I realized this photo was a bit boring and I wanted to see it in another angle. I bent up the branch and shot almost wide-open (aperture of 5.0 on my Tamron28-75mm f/2.8 ) and captured this shot. I actually prefer this photo. I love how the berries become a soft purple blur in the distance. It is so fun to play around with different shooting angles when photographing nature. A static straight-on image can become more dynamic and show beautiful depth-of-field by a simple turn of your body. Of course, I wasn't happy until I added some textures. This is my finished edit. I used three textures from the Flypaper Textures Metallic set. This texture set is stunning. I grouped a hue/saturation layer over the gray Dystrophia texture and made it warmer (click Colorize, Hue 32, Sat 32, Lightness -15). I love Flypaper Textures and get so excited when Paul and Jill post a new texture ingredient tutorial on their blog. I hope you enjoyed this little tutorial. I have a new action coming out this weekend!! !